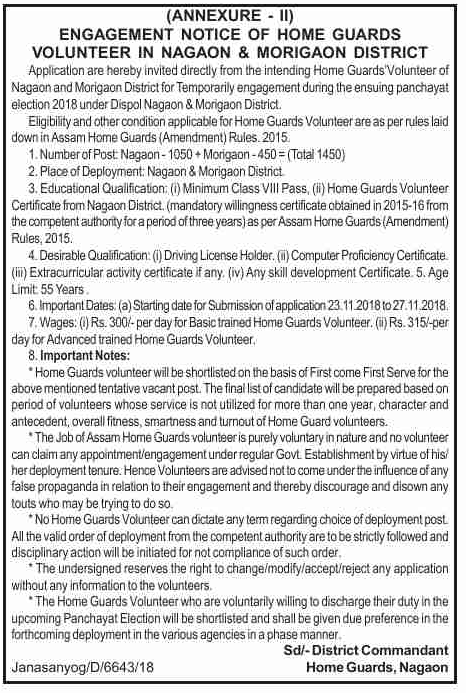 Home Guards Volunteer Recruitment 2018: Application are hereby invited directly from the intending Home Guards Volunteer of Nagaon and Morigaon District for Temporarily engagement during the ensuing panchayat election 2018 under Dispol Nagaon & Morigaon District. Those Candidates who are interested in the vacancy details & completed all eligibility criteria can read the Notification & Apply. Home Guards Volunteer Certificate from Nagaon District. (mandatory willingness certificate obtained in 2015-16 from the competent authority for a period of three years)as par Assam Home Guards(Amendment) Rules, 2015. Home Guards volunteer will be shortlisted on the basis of First come First Serve for the above mentioned tentative vacant post. The final list of the candidate will be prepared based on the period of volunteers whose service Is not utilized for more than one year, character and antecedent, overall fitness, smartness and turnout of Home Guard volunteers. No Home Guards Volunteer can dictate any term regarding the choice of deployment post All the valid order of deployment from the competent authority are to be strictly followed and disciplinary action will be initiated for not compliance of such order. The Home Guards Volunteer who is voluntarily willing to discharge their duty In the upcoming Panchayat Election will be shortlisted and shall be given due preference in the forthcoming deployment in the various agencies in a phased manner. Last date for submission of application 27.11.2018. .